Pastor to McGlothen Temple Church of God in Christ from 1987 until the present. Administrative Assistant John A. Jennings, a son of McGlothen Temple has allowed God to be his guiding light. 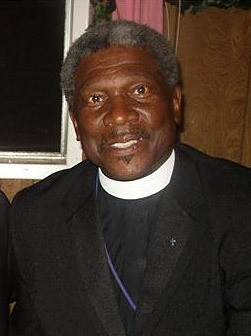 He currently serves as Administrative Assistant to Bishop Nathaniel Bullock and Chairman of the Ordination Board of California Northwest Jurisdiction, Emeritus Superintendent to the Greater Richmond District, but his greatest joy comes from serving as Pastor to the McGlothen Temple Church of God in Christ. He gained his early knowledge of God, through his Father's teachings in the Baptist Church. During 1951 Superintendent Jennings' began to work God's will for his future; through his efforts to assist his Father in the building of a church edifice. He later served on the Deacon's Board and as Sunday School Superintendent. In 1969, while Bishop C. J. Davis was the Pastor, Pastor John A. Jennings and his family became members of McGlothen Temple Church of God in Christ. He served faithfully in the Music Ministry and as a member of the Deacon's Board. During 1976 he accepted his calling to the Ministry of Jesus Christ and was ordained and Elder in 1979. Also in 1979, Bishop Davis appointed Elder Jennings to be Pastor of Mount Zion Church of God in Christ in Oakland, California. Pastor Jennings later purchased a new edifice in Berkeley, California. His achievements as the Pastor of Mount Zion included the purchase of church vans and establishing an accredited Day Care Center. He served Mount Zion faithfully until the Home going of Bishop Davis. He received his appointment to the duties of Pastor of McGlothen Temple Church of God in Christ, in June of 1987 by Bishop W.W. Hamilton, Jurisdictional Prelate California Northwest Churches of God in Christ, Incorporated. Pastor John Jennings served the Richmond District as chairperson of the finance department, until he was appointed Assistant District Superintendent in 1986. In January 1989, he founded the Greater Richmond District and was appointed Superintendent to the newly organized district. Pastor Jennings seems to never tire, and works continually. As the Pastor of McGlothen Temple Church of God in Christ he has instituted new members class; an 8:00 am Sunday Morning Worship Service; a Monday Evening Prayer and Anointing; McGlothen Temple Soul Winners Attack Team Street Ministry; and San Quentin Prison Ministry. During his tenure the Bishop Clarence James Davis Education Building and the Doctor Mattie McGlothen Library/Museum were decorated and dedicated. Administrative John Jennings is a faithful and dedicated leader. He has continued the ministry of visiting those that are sick and shut-in. He is a prayer warrior and a spirit filled worker of God's will. Pastor Jennings is known for his humble spirit. He is loved and respected, by men and women of all ages, locally, statewide and nationally. He is loved and respected locally, statewide and nationally. He readily avails himself to come to the aid of anyone, whether a member of McGlothen Temple or not. He is loved at McGlothen Temple and throughout the Greater Richmond District, California Northwest and the Church of God in Christ. The members of McGlothen Temple lovingly refer to him as the "BEST" Pastor this side of Heaven! He is known for his encouraging words and always reminding you that "God loves you, he loves you and you are tough.